Treatment programmes in sub-Saharan Africa must prepare for a growing population of adolescents over the next few years as children born with HIV grow up and begin a transition from child health services to adult clinics, Dr Mhairi Maskew of University of Witwatersrand told participants at the 21st International AIDS Conference (AIDS 2016) in Durban on Tuesday. South Africa in particular is beginning to experience a 'youth bulge' as the number of infants with HIV declines due to the success of efforts to eliminate mother-to-child transmission, and children who acquired HIV during the 2000s begin to reach adolescence. HIV infections among adolescents, especially girls and young women, also remain high. Data presented by UNICEF at AIDS 2016 suggest that 29 adolescents aged 15 to 19 are infected every hour, the vast majority in sub-Saharan Africa. Unprecedented survival rates among this population highlight the need for adult services to become more adolescent-friendly. Evidence suggests adolescents are especially vulnerable to loss to follow-up and adherence difficulties as they transition to adult care with consequent rebound of viral load. Although the South African cohort is likely to be the largest, all countries in sub-Saharan Africa with successful prevention of mother-to-child transmission (PMTCT) programmes are beginning to experience this shift in the balance of needs away from infants and towards adolescents. As a group with a lower rate of viral suppression, adolescents are a particular priority for country programmes as they seek to increase the proportions of people living with HIV on treatment and virally suppressed. Without large well-defined cohorts, the monitoring of adolescent treatment programmes in this context is very difficult. Adolescents are a key group for health-systems planning. However, until now in South Africa a nationally representative cohort has not been available. So treatment outcome data are rare. Dr. Maskew and colleagues suggest that laboratory datasets from South Africa’s National Health Laboratory Service (NHLS) database may provide an important tool for national and local resource allocation and planning. The NHLS is the sole provider of laboratory testing services to public sector clinics, including CD4 cell counts and viral load testing. As such it represents a powerful database to capture a patient’s HIV care progress. Entry into care is defined as one CD4 cell count or viral load recorded for an individual in the database. Treatment initiation is measured by viral load results. Viral load is only tested in the over five year olds if they have been on treatment for six months, not before treatment. Using a national patient cohort developed from the NHLS database Dr. Maskew and colleagues determined the size of the adolescent population on antiretroviral therapy (ART) and the proportion virologically suppressed. Analysis of data on all public sector viral load tests and CD4 tests since 2004 of those under 20 years of age at test date was performed. The total number getting ART care in any given year was derived from the number of individuals with viral load results. To determine shifts in age distribution of those on ART over time, data were stratified by age and year from 2004 to 2014. The proportions of those virally suppressed were assessed by age in 2014. A total of 929,274 person-years of follow-up were analysed. Among the under five years age group, the increase in the number of children on ART was steady until 2011 after which the numbers stabilised. Children under five represented 50% of the total during the period 2004 to 2007 but probably due to the success of PMTCT programmes declined steadily, and by the time period 2012 to 2014, the proportion of under-fives had more than halved (23%). Conversely adolescents, aged 10 to 14 and 15 to 19 years, for the period 2004 to 2007 represented 11% (8854) and 8% (5904) of the total, respectively, with dramatically increasing numbers representing 28% (141,945) and 19% (96,042), respectively for the period 2012 to 2014. It is anticipated that the 15 to 19 years age group will increase further over the next five years into the 15 to 20 years age group and the increase in the numbers on treatment will be very substantial. In 2014 the proportion of those virally suppressed declined as the children grew into adolescence from 74% among 5 to 9 year olds, 69% among 10 to 14 year olds and 62% among 15 to 19 year olds. While retention, as measured by the proportion virally suppressed, declines with age, there is no gender disparity. After adjusting for site, characteristics of perinatally-infected adolescents more likely to transfer included: being on ART for a longer period of time at 10 years of age, aHR: 1.29, (95% CI: 1.22-1.35), not being severely immunodeficient at ART start, aHR: 1.25 (95% CI: 1.03-1.52), having a CD4 cell count greater than 500 cells/mm3 at age 10, aHR: 1.30 (95% CI: 1.01-1.6) and having a viral load under 400 copies/ml at age10, aHR: 1.38 (95% CI: 1.05-1.82). This group is now transitioning into adult care and it is critical to plan for this now. The age of transition into adult care is facility-dependent. Adherence issues among this population are multi-faceted with different needs from other groups. Transition into economic activity or a caregiving role in the household can also affect the ability to attend clinic and so affect retention in care. Maskew M et al. The youth treatment bulge in South Africa: increasing numbers, inferior outcomes among adolescents on ART. 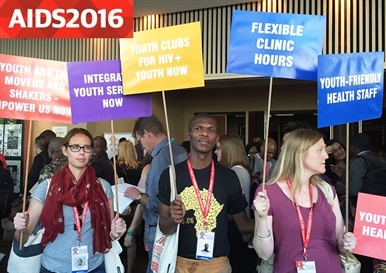 21st International AIDS Conference, Durban, abstract TUAB0102, 2016.